These are the two that spoke to me tonight. They said "Wear us Karen, we're pretty, sparkly, dainty and your coworkers won't think you're demented with your mad nail polish. Think of them when you're drinking your coffee at breakfast and blinding them with the amount of glitter you usually wear on your nails". On the left is Grammercy Glitz and on the right is Oh Soho Sweet, both from NYC. They're from the Expert Last Nail Polish range and are only €1.99 each. Oh Soho Sweet is a milky pale pink that goes on quite sheer but not streaky and is a dupe for one of the polishes Kate Middleton wore to her wedding, Bourjois So Laque in Rose Lounge. Grammercy Glitz is a cutie patootie multicoloured glitter polish in a clear base. I reckon it'd be pretty over a dark polish too so must give that a whirl. This is three layers of Oh Soho Sweet and one layer of Grammercy Glitz (I was watching tv so didn't mind lashing on the layers). There's no top coat because my beloved Seche Vite died in Spain, the heat finally kicked it into a gloopy mess so I'll be getting a new one this weekend hopefully. It's the perfect combination to make me look more tanned, look more ladylike and we all know I love any excuse to put glitter polish on! It's a cute, subtle look and after tomorrow night I'm going to see what it looks like with a matte top coat over it after seeing it on beaut today. Do we like? Do I look like I have lady fingers now? Well, I am "The Real Woman" so I must start living up to that (for now)! 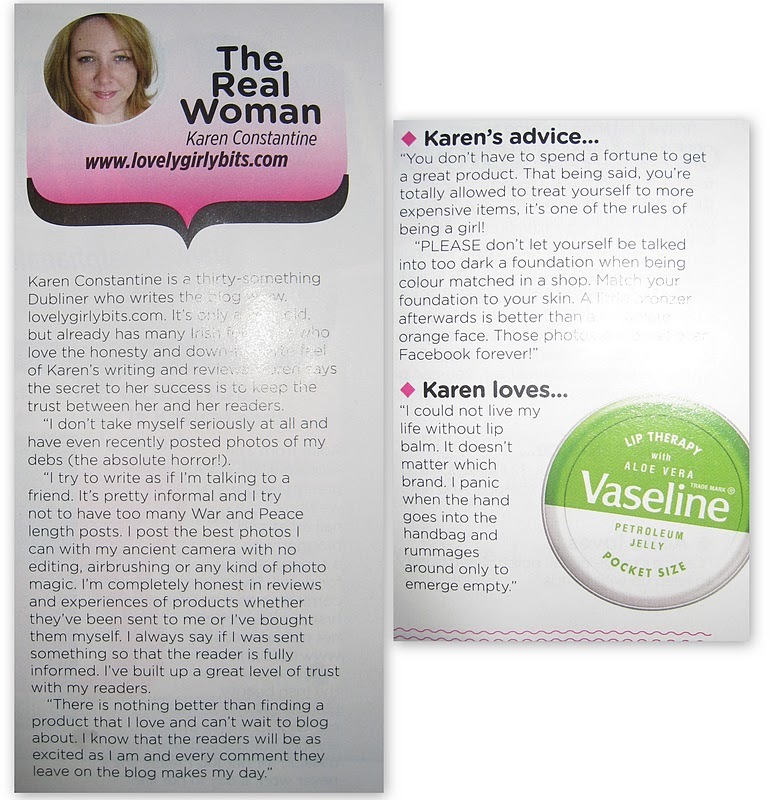 Today was a brilliant day for us here on Lovely Girlie Bits, we were featured in U Magazine! What a year it's been and this was a great way to start off the second year of our blog! That's me! On the right! I'm "The Real Woman"! I'm in excellent company with the Pixiwoo sisters, Ellie Balfe, Emma Farrell, Aoife from The Alpha Nail and the beaut.ie ladies, or should I say "Masters"! This is the interview from the magazine. 1. Tell me a bit about yourself and your role as an online beauty guru (how long you've been at it, accolades). My name is Karen Constantine and I'm a thirty something Dubliner who has been waffling about make up and beauty on www.lovelygirliebits.com since September 2010. I have been known to go into Boots for deodorant and come out having spent a small fortune and no deodorant. I don't take myself seriously at all and have recently posted photos of my debs (the absolute horror! ), have proclaimed my secret love of The Scrunchie and as I've a degree in Science from UCD, I have put it to good use and tested out waterproof mascaras by dunking my face in a sink full of water. Makes perfect scientific sense, no? I try to write as if I'm talking to a friend. It's pretty informal and I try not to have too many War and Peace length posts. I post the best photos I can with my ancient camera with no editing, airbrushing or any kind of photo magic. If readers want to know how a foundation looks on the skin, that's exactly what they'll see. And there's where my role as a beauty blogger comes in. I'm completely honest in reviews and experiences of products no matter if they've been sent to me or if I've bought them myself. I always disclose if I was sent something so that the reader is fully informed when they decide whether to buy something or not. I've built up a level of trust with my readers and I think they know me now! I research products I want to buy on blogs myself because it's a way of seeing what it actually looks like on the skin rather than just in the packaging. It's much more fun to write about products I love, but sometimes I have to spill the beans on products that just didn't work for me but I try to do it in a funny way so that it's not just one big post about me giving out, that's boring for me and the reader! My sister, Joanne, recently joined forces with me and is tackling the fashion end of things but I am converting her slowly into appreciating all things make up and beauty. We're celebrating Lovely Girlie Bit's first birthday at the end of September and are closing in on 100,000 hits and have over 500 followers so far, crazy! 2. How did you get into your particular area of beauty and why did going online make sense for you? - I'm a regular reader of beaut.ie and am completely in awe of Aisling and Kirstie. I found myself checking their site when deciding whether to buy a product or not and thought "Karen, you're always buying products to try out and you have stuff to say about them, so why not put your thoughts online and leave your poor family and friends alone, they have no interest in what you have to say about Lush solid shampoo bars." This was my outlet and as the number of followers continue to increase, it's nice to know there are people out there reading what I think! Now I justify buying certain products "for blogging purposes", any excuse! 3. What's the best part of your job? - I'm met some brilliant people over the past year and love being a part of the growing Irish blogging community. I've been lucky enough to go to the beaut.ie awards a few weeks ago, the L'Oreal Colour Trophy Awards and have been to events and launches. I never for a second thought I'd get to do these types of things when I started out and now have proper reasons to lash on the make up! Being a beauty lover is an expensive habit but fortunately I'm sent products to test out and review that I might not think to normally buy and I'm extremely grateful for that. It also means the blog is more varied with products from all ranges on the budgetary specrum. Finally, there is nothing better than finding a product that I love and can't wait to blog about. I know that the readers will be as excited as I am and every comment they leave on the blog makes my day. - Beauty? You don't have to spend a fortune to get some great products these days. Our local chemists, Boots and Superdrug are full of affordable products that are excellent quality. That being said, it's totally allowed to treat yourself to more expensive items, it's one of The Rules Of Being A Girl. I've posted looks using high end products on one eye and more affordable products on the other and asked if readers can tell the difference. Life advice? If everything is falling apart around you, keep on smiling. 5. What one product or product range could you not live without and why? I could not live my life without lip balm. It doesn't matter which brand. I panic when the hand goes into the handbag, rumages around only to emerge empty. I will be honest, this rarely happens because I have been known to carry 11 lip products in my bag, from lip balms, lip glosses and lipsticks. My cute EOS lip balm is always close to me! 6. What's been the key to success in your online endeavours. 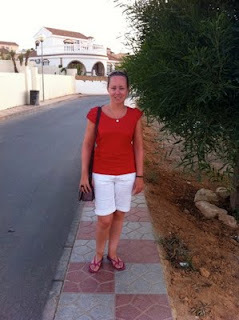 - I treat the blog as my second job and put a huge amount of time and effort into it. I try to blog regularly with funny, relevant content. Twitter has been brilliant for advertising new posts and giveaways and also for getting in touch with companies, fellow bloggers and readers of the blog. We have a Facebook page set up for those that don't use Twitter so they can be alerted every time we publish a post. I know if it wasn't for the support from our readers, the blog wouldn't be successful and we love running giveaways to thank everyone. 7. What's the biggest beauty mistake people make that you would like to correct? - Please please pleeeease don't let yourself be talked into going too dark with your foundation when being colour matched in a shop or when colour matching yourself! Match your foundation to your skin. A little bronzer afterwards is better than a complete orange face when going out. Those photos will be all over Facebook, out there forever! Mascara - I am an absolute mascara fiend and love trying new ones in the hopes they'll give me lashes like the girls in the ads (even if they do have fake lashes on and those lashes have been digitally enhanced, it doesn't matter, I want them) I have two current favourites right now and please don't make me choose. I'm loving Max Factor's False Lash Effect Fusion and Bourjois Volume Fast & Perfect rotating mascara. My favourite waterproof mascara is The Body Shop's Big and Curvy Waterproof Mascara, it doesn't budge a single bit even after a double dunk of my face into a sink full of water. Foundation - I am on the never ending hunt for my perfect foundation. That elusive product that will give me plently of coverage without looking cakey, will keep shine at bay and makes me look flawless. If it could give me Kim Kardashian's skin, that would be grand thanks. Any foundation suggestions would be greatly appreciated! Cleanser - Emma Hardie's Moringa Balm. I've been using it for over a month now and it'll take something major to change my mind from this. The balm and the micro fibre cloth are two little gems that have changed how my skin looks and feels where I feel confident enough to go to work with Liz Earle's Sheer Skin Tint on my face, which is unheard of for me! Beauty Tool - My Babyliss Big Hair styler is the business and ladies should add it to their Christmas wish list (yes I said Christmas!) It makes me look like I've gotten my hair done professionally and all I do is stand there and hope for the best that it doesn't tangle my hair. Love it lots. Hair product - Lush's Marilyn hair treatment. This was my first product review on the blog last year. It's aimed towards ladies with blonde hair but I've used it when I had really dark brown hair and nothing else has given my hair such shine. If you're looking for soft, sleek, smooth hair, this is the treatment for you. I have repurchased this many times and will continue to do so. Love Lush. 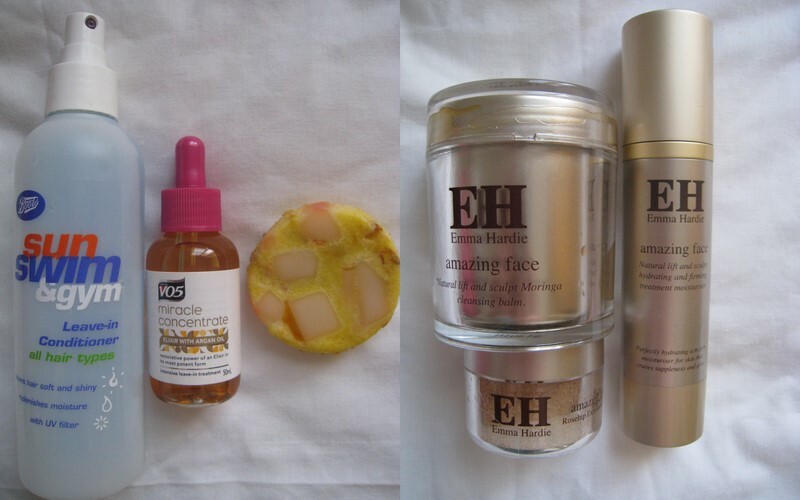 Moisturiser - I've been using Emma Hardie's Professional Moisturising Cream for a month now and love everything about it. It smells divine, has the benefits of a serum and a moisturiser and you can use it morning and night. Nail polish - I can't choose one. No, I actually can't so here are my top picks! 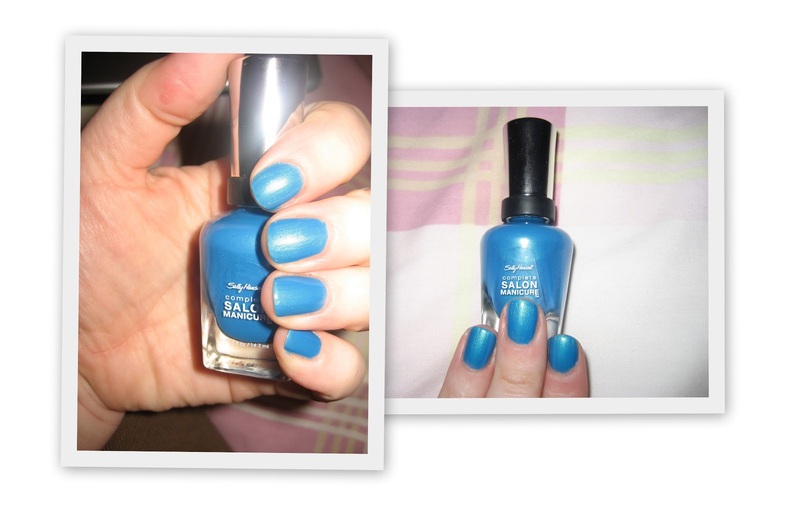 NYC's Prospect Park Pink, China Glaze's Ruby Pumps, Chanel's Peridot, Ciate's A Dangerous Affair and Sally Hansen Complete Salon Manicure in Calypso Blue. Bronzer - The Body Shop's Honey Bronze Bronzing Gel for Face. This gives the most natural, sun kissed glow of all the bronzers I've ever tried and yes, it is scary when you first squeeze it on to your hand ready to apply but it is gorgeous and needs to be tried. Well ladies, I went, I sunbathed, I melted and I was very good in the make up buying department *ahem* We won't talk about the shoes and scarves I bought, sweet baby Jesus I'm sorted for life now in that regards! I had a lovely time and can't believe the two weeks went by so quickly. Now it's back to business and we're gearing up to finish our first Blogoversary celebrations and pick some winners! So do you wanna see what I bought? Yeah, thought so... I got my beloved Elie Saab perfume in the duty free on the way home yesterday and it came with a little body lotion and 2 samples to carry around in my already heavy bag. A review of this is coming soon but be prepared that if I meet any of you over the coming weeks, I will be making you smell me, that's how much I love this perfume. Next up was the only purchase made in the duty free on the way out, that's how restrained I was! They're Real! from Benefit made the cut and I snapped it up. Same goes for this, a review is coming soon with a bit of a twist. It's Chanel's Illusion D'Ombre in the shade Epatant and it was love at first sight. Review soon as usual. Didn't I do well? (Ignoring the shoes, scarves, bags and blazers I got too *ahem*) I missed ye all and am looking forward to getting back into my routine, I have lots to blog about! But on the way to work in the car I grabbed my phone and took pictures. Its a subtle dark purple and I love it! What colour is on your nails today? Daisy Loves!!!! Congrats! I'll send you an email shortly for your address. Thanks a million for everyone who entered and don't worry - more giveaways to be added shortly as part of our happy birthday! Avon has been around for a jaw dropping 125 years! To celebrate that and to continue it’s support in the fight against breast cancer, Avon are launching these pink products in an effort to raise more money to help ARC Cancer Support. Avon sent us the pin and compact and we couldn’t wait to show them to you. The Avon Breast Cancer Crusade pin is only €2.50 and all proceeds go towards ARC Cancer Support. 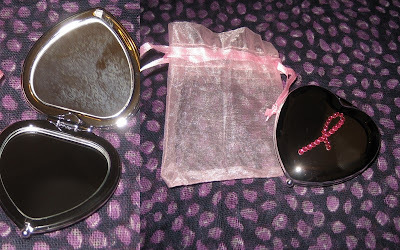 The Avon Breast Cancer Crusade compact mirror is €6 and is absolutely gorgeous. 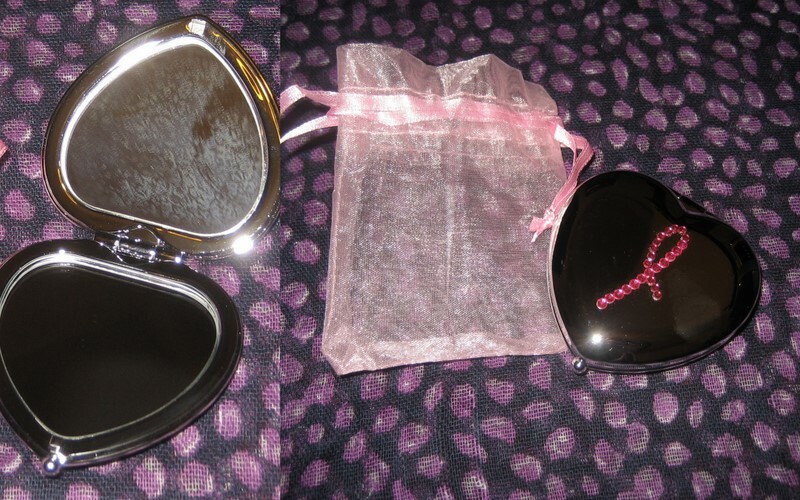 It has two mirrors and is topped by the pink ribbon design in cute pink diamantes. 25% of proceeds will go to the ARC Cancer Support and the rest of the profits will go to non-profit projects. 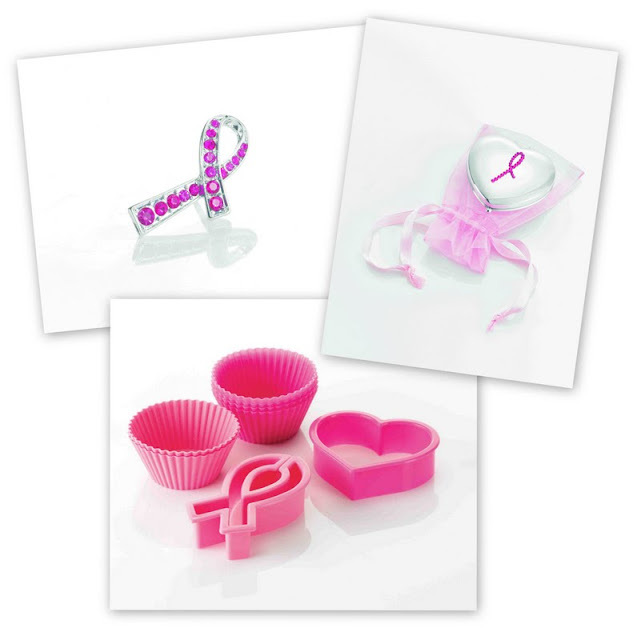 The final product that is part of this launch is the Avon Breast Cancer Crusade baking set. Check out the top picture for a look. It’s €7.50 and contains cupcake moulds, a heart cookie cutter and a pink ribbon cookie cutter. 5% of the profits will go towards ARC Cancer Support and the remaining profits will go to non-profit projects. So far, the Avon Breast Cancer Crusade has raised over €900,000 in Ireland in association with ARC Cancer Support. That’s an amazing number, let’s help them to reach €1,000,000. Giveaway number 3! 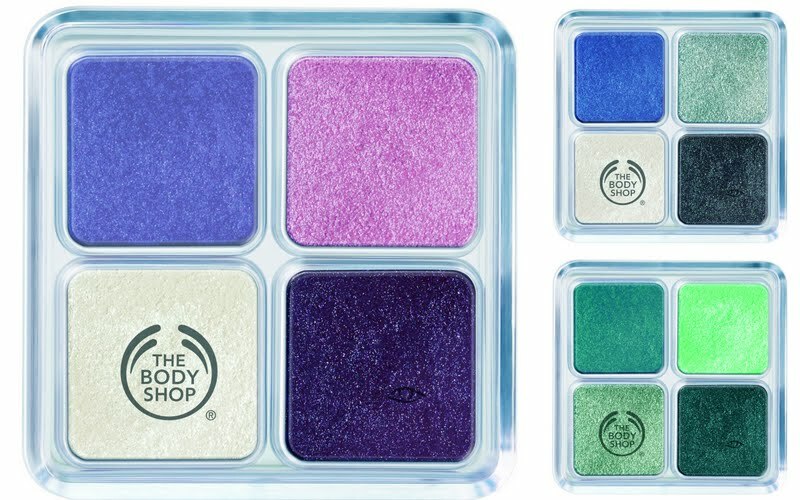 Win a Shimmer Cube from The Body Shop! Well ladies, it's time for the next giveaway to celebrate the end of our first year blogging! We have one of the new Shimmer Cubes from The Body Shop up for grabs. Click here to learn more about them! On the left is Bunch of Violets, top right is Blue Moon and bottom right is Green Light. The lucky winner of this will get to pick one of these gorgeous shimmer cubes and look fabulous! You must be a follower of the blog. I will totally be checking as always, so no Anonymous entries please! If you're not a follower, click on the Follow button on the right of the page and sign up with your Google Account. 2. For a second entry, follow us on Twitter and leave your twitter username below. 3. For that third entry, get your behind over to Facebook here and "like" our page and leave your Facebook username in the comments below. 4. 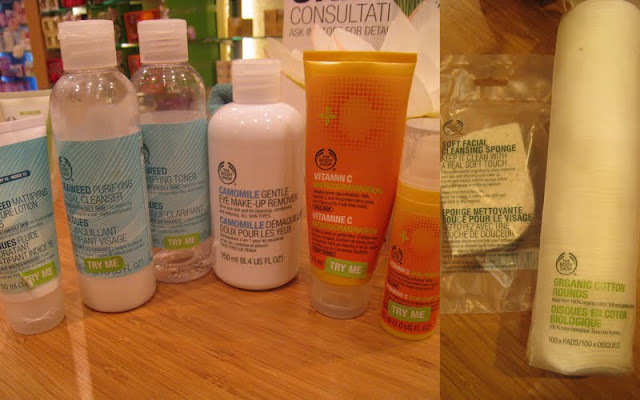 For your fourth and final entry, tweet this message "@Lovelygirlybits is giving away a Shimmer Cube from The Body Shop! http://alturl.com/psgre #girliebodyshopgiveaway "
The giveaway ends on Saturday October 1st at midnight GMT so lots of time to do all of these steps to increase your chance of winning! It's open internationally and Random.org will be used to choose the lucky winner and we will contact them to get their address. 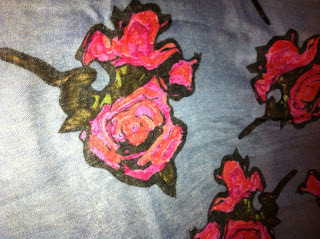 It's a really pretty scarf, perfect for those winter mornings when you need a pop of colour. This scarf can transition easily from Autumn to Winter to Spring and even Summer. It's 100% cotton and feels so soft. Hope you girls like it too! This international giveaway ends soon - this Wednesday 21st September at midnight GMT so hurry and enter!!! 4. For your fourth and final entry, tweet this message "Get on over to @Lovelygirlybits to win a fab Rose Print Scarf http://www.lovelygirliebits.com/2011/09/giveaway-rose-print-scarf.html #giveaway "
The giveaway ends on this Wednesday 21st September at midnight GMT so hurry to do all of these steps to increase your chance of winning! Random.org will be used to choose the lucky winner and we will contact them to get their address. Good luck to all scarf lovers out there!! When I came to Spain earlier on in the year, I did my best to curtail the amount of make up and products I brought with me. The thing was, would I have learned from my past mistakes? 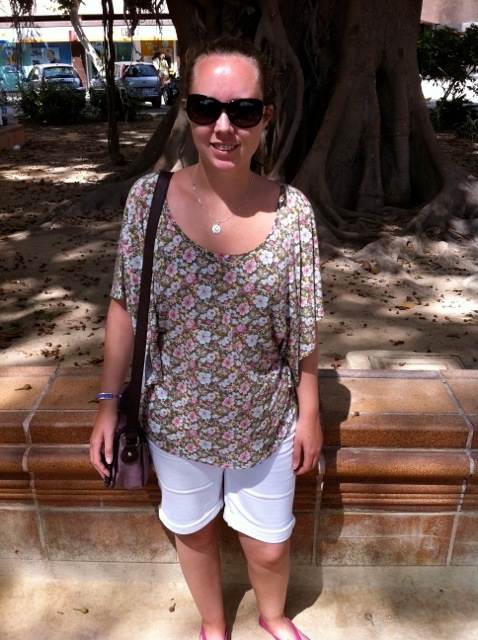 Have a read here about what I brought the last time and what I actually used. This time I tried to listen to my past self and brought what I thought I would actually use. Look at me, trying to grow and be all wise! Let’s start with the make up shall we? From left to right we have YSL’s Eyebrow Pencil in shade 02, The Body Shop’s Honey Bronze Bronzing Gel for Face, Benefit’s Cha Cha Tint, Catrice’s Gel Liner from the Out of Space collection in the shade Houston’s Favourite and Rimmel’s Vinyl Gloss with no shade whatsoever on the packaging. There’s something missing in that photo isn’t there? Donde estas las mascaras? (me no speaky Espanol) Las mascaras are here, lookie lookie! Top to bottom we have Bourjois’s Volume Fast & Perfect rotating mascara, Deliplus Longitud Xtrem mascara (from Mercadona in Spain), Max Factor’s False Lash Effect Fusion and La Roche-Posay’s Respectissime waterproof mascara that I’m currently testing out. You would think that was enough mascaras to bring on a holiday? Not para mi, no, I went and bought this in the duty free for the grand price of €19 something. I caved and bought Benefit’s They’re Real mascara so stay tuned for a review on this soon! These were my hair and skin products that made the cut and came on their holidays too. Boots’ Sun Swim & Gym leave-in conditioner, VO5’s miracle concentrate and Lush’s Godiva solid shampoo bar were my hair products of choice. 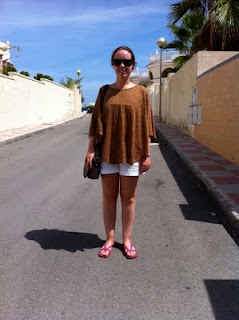 I couldn’t leave my current skin regime at home so Emma Hardie came to Spain with me. The balm melted a bit in the heat and got caught in the packaging leaving a lovely glaze on my tub, mucho annoying! My eye cream of choice that I’ve been testing out for the last 5 weeks or so came too but I can’t tell you about that yet, stay tuned for my review at the end of this month or the start of October. 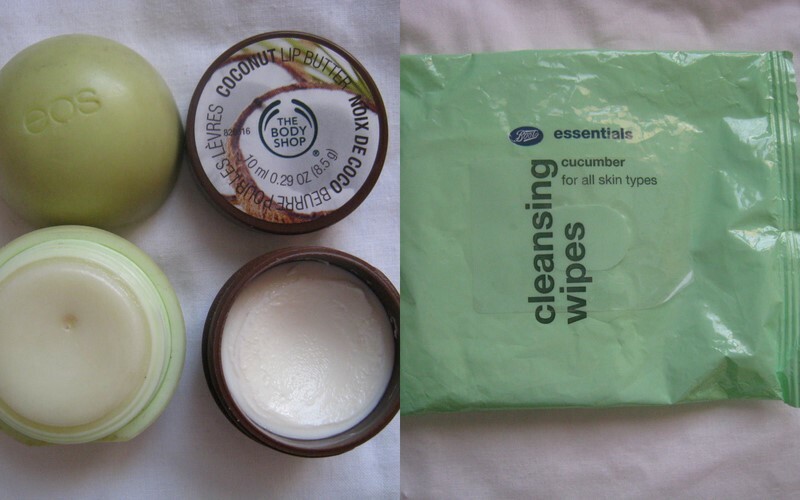 My grubby little EOS lip balm ball came with me as did The Body Shop’s Coconut Lip butter and no holiday to Spain is complete for me without my cucumber wipes from Boots. These stay in the fridge, ready to cool me down after being out in the sun. Finally are the polishes that made the all important cut! From left to right we have Essie’s Billionails, fortifying phase two nail strengthener, Essie’s Bermuda Shorts, Laca de unas shade 76 (from Mercadona in Spain), Sally Hansen’s Calypso Blue, NYC’s Prospect Park Pink and Leighton Denny’s Viva la Diva. I have been here since last Friday night and haven’t bought a nail polish yet, aren’t you proud of me? Especially considering the last time I was here, I managed to bring 13 back with me. Restraint is my middle name these days. (That and the fact that I pretty much got all the colours I wanted the last time, but we’ll go with the fact that I’m restrained *ahem*) I am making the most of the sunshine here and getting every last bit of use out of my summer nail polishes before it’s time to delve into my Autumn colours…. So how did I do this time? 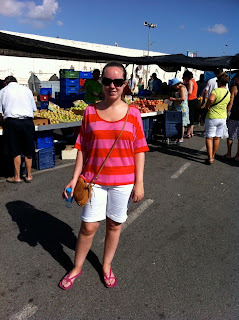 I'm missing getting up in the morning, seeing the bluest sky ever and feeling the heat of the sun, so to cheer myself up I was having a look through the holiday pics and decided to share with you lovely people some of the outfits I wore on holidays! I think my favourite outfit was either the pink maxi dress from Old Navy or the last pic as I don't own anything red as I'm usually too pale to wear it. Gotta love having a tan!!! Unless you’ve been living under a rock or have no interest in make up, you will know that Liz Earle have launched their Sheer Skin Tint. My blogger timeline has been full of reviews of this and I think it’s a great way to see how the product actually looks on the skin before purchasing. I was sent this to try and chose the lightest shade, Bare. 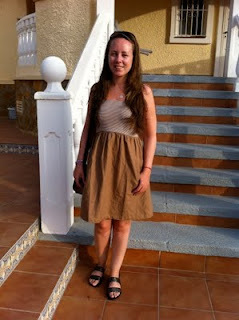 If in doubt, I always go for the lightest shade of something and then bronzify myself! The other shades are Beige and Beach. I’m very hesitant about ordering foundations online because I can’t colour match myself, but the Liz Earle team have come up with a solution for that. If you’re ordering from them online, order the shade you think you are and they’ll send you a sample of all three shades too to try out before you open your full sized bottle, great idea! 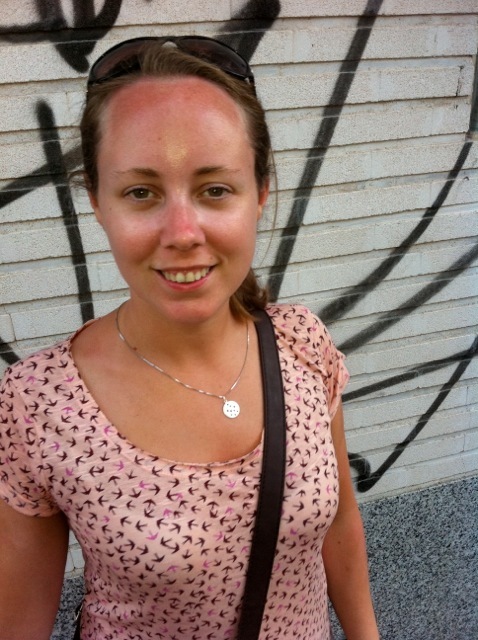 Wanting to expand from skin care to colour, a skin tint was the perfect way to do that. Of course, being Liz Earle, it comes packed with ingredients that make your skin happy, including Liz Earle’s blend of botanicals, vitamin E, avocado and borage. Let’s talk packaging shall we? The squeezy tube is a beautiful navy colour with a pearl finish. It’s classy and elegant and looks like nothing else in my stash which means it’s easily found in a rush. 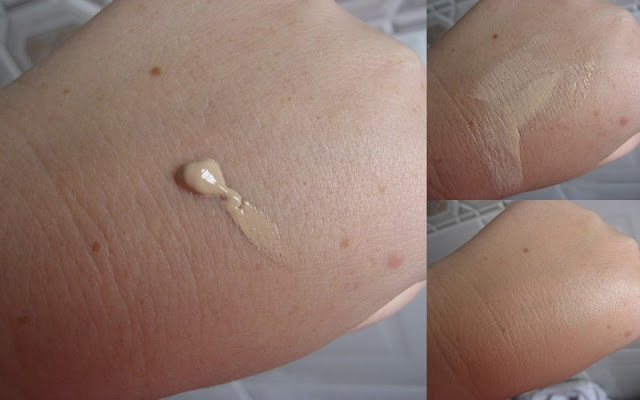 The product itself is thick, unscented and looks like a regular liquid foundation. However, it blends into a sheer layer on the skin, evening out the skin tone. As I have an oily T zone, I apply powder over the top to set it when wearing it to work. There’s nowt worse than having your make up slide off your face. Up until about a month ago, I hadn’t been taking care of my skin properly, but now I have a brilliant skin care routine and because of that, I now have the confidence to go out with the Sheer Skin Tint on my face. See? Left is no make up , eek! Right is with Liz Earle’s Sheer Skin Tint. 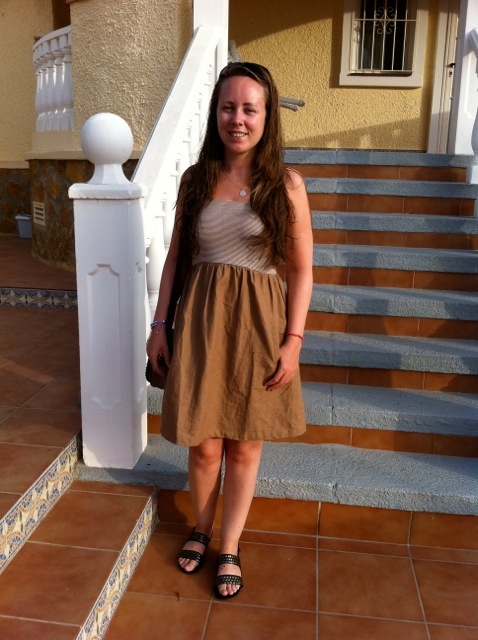 I apologise for how shiny I look, I’m in Spain right now and it is absolutely boiling, so I have a perpetual glow (sweaty Betty), whether I like it or not and of course, I didn’t bother to bring any powder avec moi… Anyway, you can see that it really does even out the skin tone but yet lets my skin peek through. If you’re not comfortable with tinted moisturisers or BB creams and need more coverage then this isn’t for you. If you have decent skin and you want something light and natural, then go buy this. It lasts like a normal foundation for me, as in by the end of my work day, it has worn off a bit. I get my oily T zone and need to powder it but I like being able to see my skin when it’s looking good and I feel like I’m giving my skin a break from thicker foundations when I use this. If I’m having a good skin day, I’ll top it off with my Make Up Forever HD powder and if I feel I need a tiny bit more coverage, then my MAC Mineralise Skin Finish Natural comes out. Would I purchase this myself? I actually would. It’s €23.75 for 40 ml of product, so it’s not super affordable but when you know it’s coming from Liz Earle, you’re on to a good thing. I’m going to make Joanne give it a go when I’m back from Spain because she has dry skin and rarely wears foundation so keep an eye out for a make up beginner’s review of this! Liz Earle Colour will be releasing more products soon, expanding their make up range so I’m looking forward to seeing what they have to offer. Will you be picking the Sheer Skin Tint up ladies? 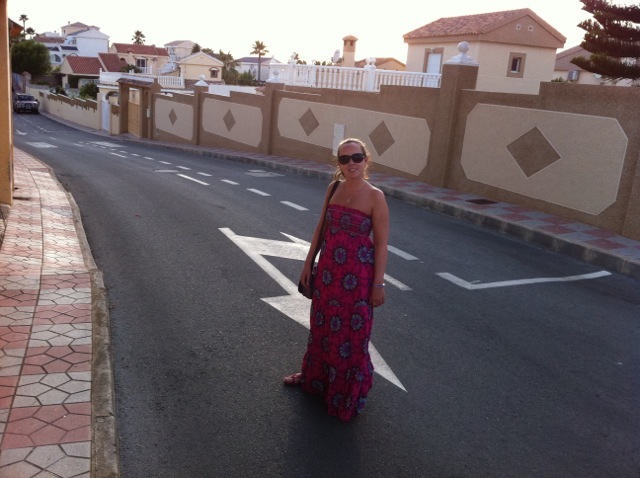 As some of you know, I have just come back from a two week holiday to Spain with my boyfriend. Weather was amazing, food was fantastic - all in all it was a fab holiday! So jellas Karen is over there at the moment! Anyhoo here is a brief summary of what I got. Top left is a Sephora brand eyeshadow - Hawaiian beach No 52. I have this years and recently it ended up breaking into a million different pieces so had to get another one. The two sets of earrings were bought for €4 each and the Elizabeth Arden Eight Hour Cream set I got in Duty Free on the way back. It's the Skin Protector and Intentisve Daily Moisturiser for Face SPF 15. I suffer from really dry/sensitive skin so I'm hoping this does the trick. Next is where I'm showing the world I have a problem... A few weeks ago I wrote this post about being a scarf-a-holic. I actually didnt realise how many I had actually bought in Spain until I was showing them to Karen, and bare in mind, these aren't all the scarves I bought. I have another 4 or 5 for presents too! Some of these I bought for Karen too so please don't judge me ;) My absolute favourite is the bottom right one, navy with white stars. I got it in Pull & Bear for €10 and its a huge scarf, so soft and sooooo comfy. I brought it on the plane to make sure I was extra comfy :) I just LOVE scarves, they can dress up or down an outfit and I know each and every one will get great wear with the colder weather coming upon us. I love the colour and the tiny little birds on it. 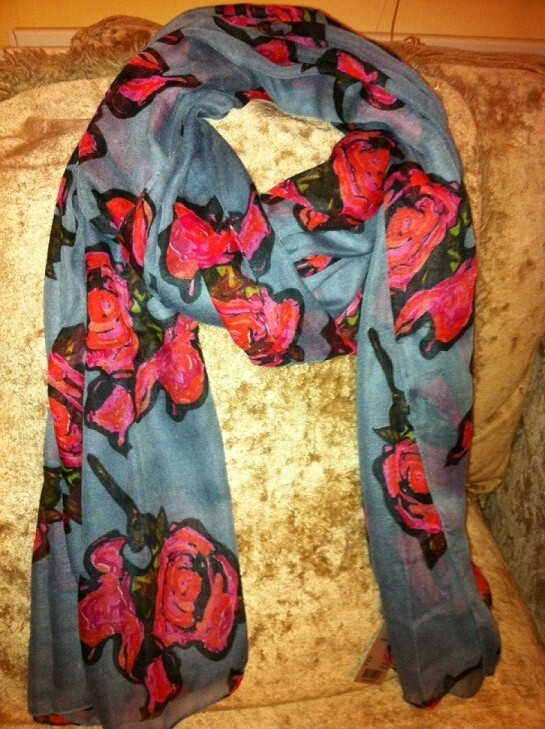 Perfect to pair with jeans and a nice comfy chunky knit cardi - which I have yet to find. Will bought me the necklace I'm wearing and I *love* it. Its by John Rocha - never knew he designed jewellery. Its a matt silver with 9 small cut out stars. Being the wonderful sister I am I picked Karen up a bottle of Chanel's Peridot nail-varnish in Spain after hearing about it non stop for a while :) The goldy/greeny colour of this nail-varnish is too hard to resist and I just *had* to try it on, and I love it! Lovely Girlie Bits is 1 year old! 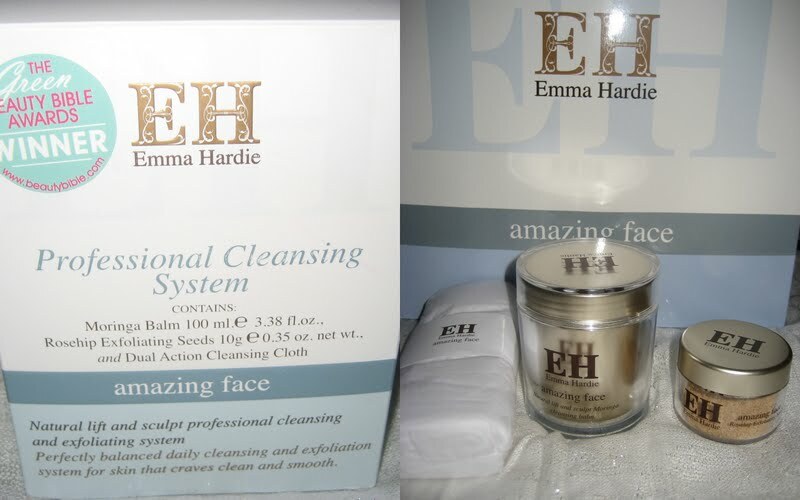 Win Emma Hardie's Professional Cleansing System! On September 25th, our little blog turns the ripe old age of 1! We are all growed up now. When I started the blog last year, I never imagined I would love doing it so much. I have met so many amazing girls through the growing beauty blogging community and made some great friends. I've been so lucky to be invited to events, launches, awards and have had the opportunity to try out some excellent products. Being a make up and beauty lover is an expensive hobby so having the chance to try things I might not have been able to try is a much appreciated perk of the job! And it really is a job. Finding the time to write, find inspiration, take photos, edit photos all takes time but I love every second of it. Wouldn't spend my free time doing anything else! I'm delighted to have my sister Joanne on board to help out in the fashion department, she's much better at that than me! So, to start off the next month of giveaways, we're starting off with a biggie. I posted recently about part of my new skincare regime here. I am in love with Emma Hardie's Professsional Cleansing System. So much so that we're going to be giving one away to a lucky follower! I defy you not to love this and will be looking forward to hearing how the winner gets on. 4. For your fourth and final entry, tweet this message "Get on over to @Lovelygirlybits to win Emma Hardie's Professional Cleansing System! http://alturl.com/ujjgg #giveaway "
The giveaway ends on Saturday October 1st at midnight GMT so lots of time to do all of these steps to increase your chance of winning! Random.org will be used to choose the lucky winner and we will contact them to get their address. The one where Karen gets her first ever facial! Thanks to The Body Shop! I finally did it ladies. I, Karen, beauty blogger and self confessed lover of all things make up, beauty and cosmeticals went and got myself a facial! I have always had this weird phobia about facials and manicures, imagining I'd feel claustrophobic with someone else's hands all over my face. I don't know what my fear with manicures was, I think because I never really took care of my nails until recently, I was afraid I'd scare the manicurist. I had nail and cuticle shame. Fiona started off by using the Camomile Gentle Eye Make-up Remover (€11.95-250mls) on some of the Organic Cotton Pads (€3.95) to remove my eye make up. This felt so lightweight on the eyes and she was careful not to pull or drag the cotton pad around my eyes. Instead she placed the pads over my eyes and tapped ever so gently on the pads to help loosen my make up. There was no oily residue left on my eyes, just clean eyelids. We decided to use the Seaweed range since it was best suited to my combination skin. First up was the Seaweed Purifying Facial Cleanser (€10.95-200mls). Fiona applied it all over my face, massaging it in using circular motions. It was at this point that I started feeling really rather relaxed and could have happily fallen asleep! She used more of the cotton pads to remove the dissolved makeup and cleanser. 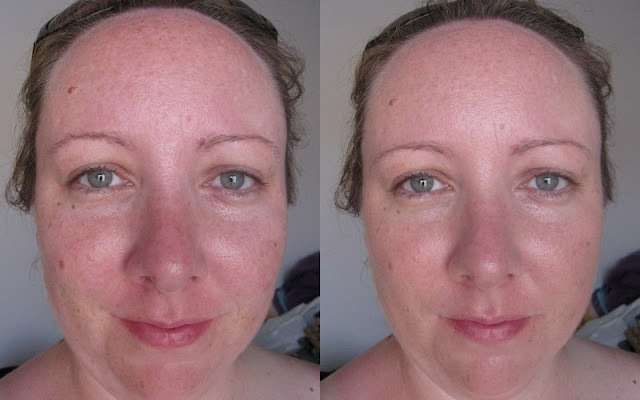 She used the Seaweed Clarifying Toner (€10.95-200mls) to remove any remaining cleanser. This felt fresh and light on my skin and is alcohol-free which is always good for the aul skin. Before we went to use the Seaweed Mattifying Moisture Lotion SPF 15 (€16.50-50mls), we decided to have a bit of an exfoliation since I'm such a fan of that. As soon as I found out that the Vitamin C Microdermabrasion (€17-75mls) was the "scrubbiest" of all the scrubs The Body Shop offers, I knew this was the one for me. Containing crushed garnet stones, it brightens the skin giving a more radiant look. Who wouldn't want to use something with smushed up gemstones in it? This is my type of scrub, not too abrasive, clears away all the dead skin cells, smells good, happy days. Fiona used a facial cleansing sponge (€4.95) to remove the scrub, leaving me with squeaky clean skin. Fiona then used the Seaweed Mattifying Moisture Lotion (€16.50-50 mls) on my face which felt nice and light on the skin. It's a lightweight moisturiser that balances the oil on your skin while tackling the dreaded shine, combined with an SPF 15 and you got yourself a really lovely product. Finally we finished off my skin (I say we, but we know we mean Fiona) with the Vitamin C Skin Reviver (€21-30mls). This had a zingy orange fragrance and felt like a silicon primer on the skin. It gave my skin a super smooth finish ready for make up, which I didn't have time to get done there unfortunately, next time! I got a little sample of this and the scrub to play with so will give my full review on them soon. All in all it took 30 minutes and was a really nice way to end my day! I walked Grafton Street with no make up feeling radiant and confident (while trying not to fall, this always happens when I get smug like this). Facials usually costs €15 but keep an eye out for skin care promotions in the shop where you can get a complimentary facial. If you wanted to get your make up done, that costs a mere €10 and both charges for the facial and makeover can be redeemed against make up and skin care products. I will most definitely be getting another facial, along with getting a make over and sure while I'm at it, my brows need a fixin' so keep an eye out for that after my holidays! Thanks to all the girls in The Body Shop on Grafton Street, especially my twin Fiona and the lovely Suzanne who organised it all. I'll be back soon, see what you've started now?! Has anyone gotten any of these done in The Body Shop?